Although the Pittock Mansion has been overlooking Portland for more than 80 years, there is always something new to see when visiting the historic site. Whether it's the mountaintops peaking through the clouds or the continuing efforts by the staff to bring the mansion back to its former glory, the mansion is a must see for anyone interested in Portland history or grand views. "Some days we can see six mountains from here," says Lucy Smith McLean, mansion curator. "When they designed this place they really opened it up to the views." The 46-acre estate features several buildings and a yard that is wonderful for picnics, sitting at almost 1,000 feet in altitude directly above Portland. The 16,000-square-foot mansion is filled with the history of Portland and of the Pittock family - and there is a constant effort to clean up and update the mansion. "Right now we are on the cutting edge of restoration when it comes to old wallpaper," McLean says. "In the breakfast room we are working on trying to restore the wallpaper. Over the years it got really dark and we are digitally trying to figure out what color it was so we can recreate it." Projects like this keep the mansion ever changing and growing. McLean says that during her more than 25 years as curator, she has seen rooms open to the public and that's what makes the mansion so exciting. In 2000, the kitchen area was opened to the public with a new antique stove and handcrafted flooring that mimic the original flooring. "We actually interviewed a lady who as a little girl visited the mansion and remembers the stove," McLean says. "That's how we were able to find the right stove and the floor pattern." Although the mansion was finished in 1914, it has some amenities found in homes today such as an intercom, central vacuum system and indirect lighting. According to McLean, the house was designed in 1909 and includes Turkish, English and French designs. Visitors to the mansion are not only treated to learning about a family that was integral in the history of Portland, but they can see some amazing architecture, landscaping and views of downtown Portland. "I love looking out the windows and seeing people having a picnic and enjoying the views," she says. "I think it's one of the best places to visit in Portland." Currently the basement of the mansion is available for business meetings and dinners. Tours of the mansion are available every hour. For more information about the location, tours or the history of the home go to the Pittock Mansion's Web site or call 503-823-3624. About Pittock Mansion: A 16,000-square-foot mansion with 44 rooms (23 which are open to viewing) in Portland's West Hills that is rooted in history. Visitors can enjoy the architecture, stunning views or the history of the Pittock family. What to bring: The Pittock Mansion is a walking tour that can take anywhere from 45 minutes to two hours. Bring your camera - but the staff asks that you do not use tripods. Picnics are welcome on the grounds, so a picnic lunch is welcome. No food or drinks are allowed in the mansion. Make sure you finish your picnic before you take your tour. Hours and Fees: Subject to change. See the Pittock Mansion Web site for current information. Getting There: Visit their Web site for a map on how to get to the mansion. Tips: When visiting the mansion make sure you do not miss the outbuildings - the gate lodge and the garage offer even more glimpses into the past and a gift shop that helps to support the operational costs of the mansion. You can dress up or down for your tour, but be sure to give yourself plenty of time to discover all the nooks and crannies of the mansion. Bringing a picnic lunch is a great way to spend an afternoon, taking in the scenery of downtown Portland. The mansion is also near the Oregon Zoo, Japanese Gardens and other parks and gardens in the West Hills. You could make a day trip out of visiting the many sites. 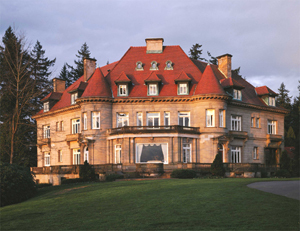 History: The Pittock Mansion was home to Portland pioneers Henry and Georgiana Pittock from 1914 to 1919. During the late 1800s and the early 1900s, their lives and work paralleled the growth of Portland from a small Northwest town site to a thriving city with a quarter million people. English-born Henry Lewis Pittock journeyed on a wagon train from Pennsylvania to Oregon in 1853 where, at the young age of 19, and in his own words, "barefoot and penniless," he began working for Thomas Jefferson Dryer's Weekly Oregonian newspaper. A consummate businessman, Henry Pittock took ownership of the Weekly Oregonian in 1860, changing its format to a daily paper. He went on to build an empire incorporating real estate, banking, railroads, steamboats, sheep ranching, silver mining and the pulp and paper industry. A vigorous outdoorsman, Henry rode horses in the Rose Festival parades, and was a member of the first party to climb Mt. Hood, one of the spectacular peaks visible from the mansion. Henry and Georgiana were at the pinnacle of their successful lives when they commissioned architect Edward Foulkes to design and build their new home overlooking Portland, the city they loved. In keeping with their loyalty to their home state, the Pittocks hired Oregon craftsmen and artisans, and used Northwest materials to build the house. The final estate included the mansion, a three-car garage, a greenhouse, and the Italianate gate lodge servants' residence, all situated on 46 acres of land almost 1,000 feet above downtown Portland.